I was sixteen when I left Singapore to attend the university in Boston. To combat my homesickness I surrounded myself with many Chinese students from Taiwan. This was not by design, but rather they were the students from Asia I found sympathetic to my loneliness. It was the mid 1970’s and China was at the end of its cultural revolution. Nixon had just visited the then reclusive regime, and there was a lot of anxiety among my Taiwanese friends about the survival of Taiwan and their own future. The Republic of China (or Taiwan) was about to be abandoned diplomatically by America. Amidst all these development my Taiwanese friends would gather at comforting and bountiful meals to calm each other. Food was the salve that soothed everyone’s nerves. These gatherings often involved communal cooking. We regularly made dumplings together for a meal, or collectively cut up ingredients for a hot pot dinner. It was during one of those meals that I learned how to make egg dumplings (蛋餃). 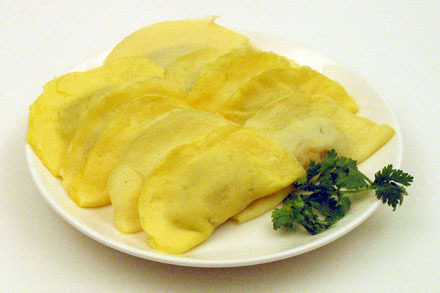 Egg dumplings are typically Taiwanese. Although my schoolmates told me they were of Fujian origin, I’ve not had them at home before. They are commonly included in a Chinese New Year hot pot meal as symbol of prosperity. As far as I’m concerned it is all about the delicious meat filling and the very light egg wrapper. If they should also bring good fortune all the better. These dumplings are made by wrapping a lump of ground pork filling in omelet-like egg wrapper. The key to the success of making the dumpling is good control of the heat under the skillet. When spreading the egg batter to make the wrapper, the temperature of the skillet should just be hot enough to quickly form a cooked skin on the bottom but keep the top uncooked and moist. 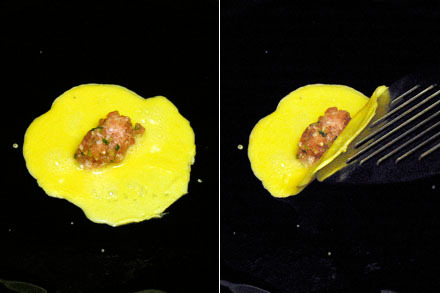 Fill the center of the dumpling with a small quenelle shaped lump of filling. Use a spatula to flip the wrapper over the meat and press the edges down against the skillet to seal the dumpling. It may seem difficult at first, but once you’ve gotten the temperature of the skillet regulated properly it is quite easy. I like to use these dumplings as an ingredient in a hot pot. I also use them in a chicken stock based soup by adding shredded napa cabbage, sliced shiitake mushroom, sliced bamboo shoots and a little bit of cellophane noodles. I’ve lost touch with many of my old school friends but I still treasure our experience of the university years. China has changed tremendously and not always for the better. Majority of its citizens are now very prosperous and personal choices in their daily life have improved. Yet political choices and freedom of expression are still non-existent. On the other hand, I feel encouraged by the positive transformation in Taiwanese politics. It has matured in the process of liberalizing and democratizing the governing institutions. I do wonder if there is a solution for this complex “two China” situation. Will the younger political generation diverge from the old thinking and move the government to a more accountable body? Or will the corruption of the government prevent this evolution? I’ll continue to eat egg dumplings and hope for the best. Mix all the filling ingredients together in a small (1 cup) bowl and set aside. Beat the eggs in a medium (1.5 quart) bowl for about one minute. In a separate small (1 cup) bowl mix the water and the tapioca starch into a thin slurry. Then add the slurry and salt into the beaten egg. Continue to beat the egg mixture until evenly combined, or about three minutes. Heat a skillet on low heat and spread a thin layer of vegetable oil using a kitchen brush. Measure one tablespoon full of the egg batter and pour in the middle of the skillet. Use the measuring spoon to spread the batter into a thin round layer of about three inches in diameter. Form a teaspoon of filling into an oval shape and put it in the center. Use a spatula to flip one side of the wrapper over until the ends meet and press down to close. Remove from heat when the edges are sealed and arrange on a plate. The meat filling should not be completely cooked. 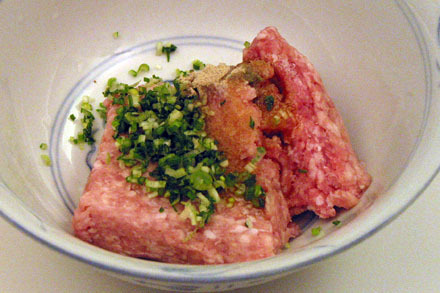 The dumpling will finish cooking in the hot broth of a soup or hot pot meal. These dumplings would look good in any light – but knowing what comfort they bring makes them even more delicious. I’ll be trying them out! Lovely post. Isn’t it amazing how shared food can be such a bonding experience? Oooh, I don’t think I’ve seen these before. They look good. Those egg/omelet wrappers look delicious. We love dumplings. There’s a little dim sum place in Orlando, rather hidden and ignored by the “foodies” in town, that we frequent, and New Year’s was the perfect time to go. Its the kind of place where you immediately get a Chinese mother, the waitresses will always come over and make sure you know what you’re ordering (“This soup isn’t with shrimp,” one told me that night, “it’s shrimp eggs. You still want it?” I didn’t.) I agree, the egg dumplings is a wonderful idea, I’ll try it. I look forward to sharing a meal with you again soon! I’ll be in NYC end of the month …how about some dumplings? Those look lovely. I’m sure if I tried the same thing, they’d be a broken mess! 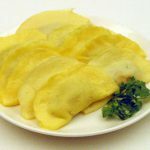 I have never seen egg dumplings befroe, they look great. I have been looking for a recipe like this forever! My nanny use to make them for me but after she left no one else could make them. I tried many times but couldn’t get the egg shell texture correct. Thanks for posting. I am going to try and make it now! I can only ever recall having seen egg rolls before, so these dumplings are a pleasant surprise! Almost like a little filled omelette. Fantastic – i was taught to cook the traditional fujian version before but now can’t remember for the life of me! Thank you for sharing the recipe, now i can make them again!! 🙂 try serving these in a hot and sour soup – yummo! I LOVE THESE! one of the things i look forward to the most on Chinese New Years. So glad you posted this since i don’t remember much about how my grandparents made it. One thing i do remember was that they used a large ladle to make the egg skin. They would pour the egg batter in to the ladle (holding it on top of the stove) and swirl it around till it is completely covered and cooked. Glad i stumbled upon this post! Could you substitute almond or coconut flour for the tapioca flour? No. The purpose of the starch is to bind the egg into a more pliable texture. Almond or coconut flour will not do that. You can, however, use cornstarch, potato starch or wheat starch. I can’t eat any of those so I obviously can’t have a go at these. Unless something like xanthum gum would work? Perhaps xanthum gum would do the trick. I’ve never use it before so I can’t really comment on it. Do let us know if you try this approach. Any suggestions on how much to use? I’ve never used xanthum gum before. I’m afraid I can’e help you there. Sorry. We have being make these for years in our Chinese New Year without fail. This dumpling is made by every family I know of. You don’t need starch nor gum to make. Just make sure the temptation is set in between low and medium.